It all goes on the line this week as the top six is reduced to just four when the AFL semi-finals kick off on Friday night. This is The Roar’s guide to all the key information you need to know about the games. Fox Footy Channel 504 is the place to watch the 2018 AFL finals series, including this week’s semi-finals fixture. The all-Melbourne derby between the Hawthorn Hawks and Melbourne Demons is scheduled for a 7:50pm (AEST) start on Friday night at the Melbourne Cricket Ground. Meanwhile, the MCG will also host Saturday night’s meeting between the Collingwood Magpies and the GWS Giants, which is advertised to begin at 7:25pm (AEST). If you wish to watch the game in high definition on Foxtel, the channel is 258. Foxtel customers hoping to catch Seven’s coverage can tune in on channels 107 and 207 for standard and high definition respectively. In order to watch the games through Foxtel, you must of course have a valid Foxtel TV subscription. All matches during the finals series will also be broadcasted on the Seven Network, although the exact channel that each match is shown on will change depending on what state you are in. If either of this week’s semi-final matches aren’t shown on Channel Seven, they will be shown on their digital back-up channels, either 7mate of Seven Two. They can be found on either station 73 or 72, while Channel Seven is on channel 70 in high definition and 71 in standard definition. Make sure to check with your local guides if you are unsure about broadcast times in your area. If you hope to catch this week’s semi-finals but can only do so online, there are several options for you. The first choice is through Foxtel’s live streaming applications. There are two applications you mat choose from, either Foxtel Now or the Foxtel App. Otherwise, you can also use the AFL’s Live Pass service to watch the games online. Every match of the AFL finals can be streamed live via the AFL app on Android, iOS or Windows mobile devices. This is a paid service, with a monthly pass costing around $14.99 per month while a weekly pass can be purchased at $4.99 per month. There is also the possibility to watch the games overseas through through Watch AFL. After falling to the Tigers in last week’s all-Melbourne derby, the Hawks will have another chance to book their spot in the preliminary finals when they face the Demons on Friday night. Hawthorn had plenty of chances to build an early lead but failed to capitalise and now face a second straight-sets exit in three years. They will need to overcome an injury to key defender Ben Stratton, who went down with an injured hamstring. David Mirra, Ryan Schoenmakers and Taylor Duryea all loom as possible replacements for the 29-year old. They will be preparing for a fired-up Demons outfit who will be looking to make the most of their first finals appearance since 2006. Melbourne jumped out to a 33-2 lead after the first quarter before holding on for a 29-point win. A late surge by the Eagles saw them run down Collingwood 86-70 last week, forcing them to suit up once more this week as they look to keep their title hopes alive against the Giants. Nathan Buckley’s side led by 10 points at three-quarter time but were overrun in the end and now face the prospect of being bundled out of the finals in straight sets. Having already been beaten by GWS earlier this year (95-79), the Magpies will be desperate to reverse their fortunes as they search for their first flag since 2010. 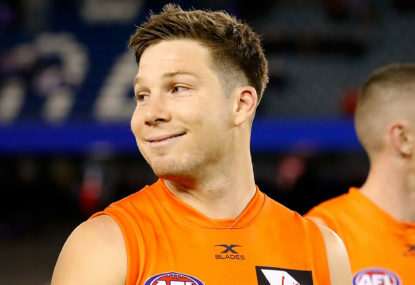 Meanwhile, the Giants have qualified for their third-straight finals appearance and will be looking to make the grand final for the first time in the club’s short history. GWS cruised to the semi-finals on the back of a dominant 79-30 win over the Swans. The win was overshadowed by a possible injury to Josh Kelly’s right knee. It is unknown whether he will play in Saturday night’s sudden-death shootout. Regardless, here at The Roar, we will have you covered with all the action from this year’s finals series live blog and highlights of every match as we progress deeper into September.